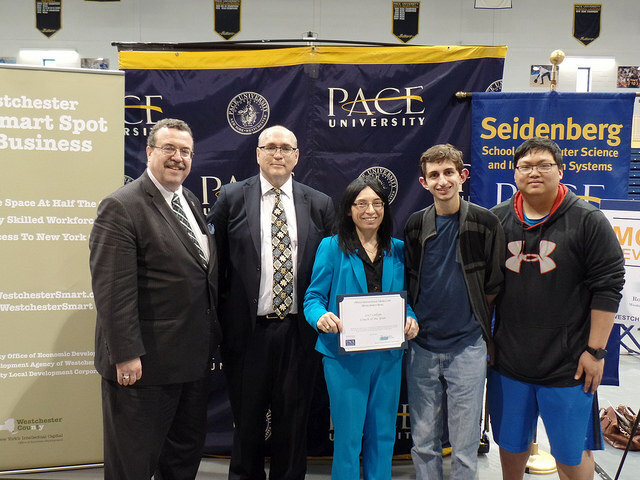 Sent on behalf of Dr. Jonathan Hill, the Dean of the Seidenberg School at Pace University. The loss of Jean Coppola on October 29th was a huge hit to our community. We received many messages of support, as well as memories of times with Jean ranging from recently to several decades ago. 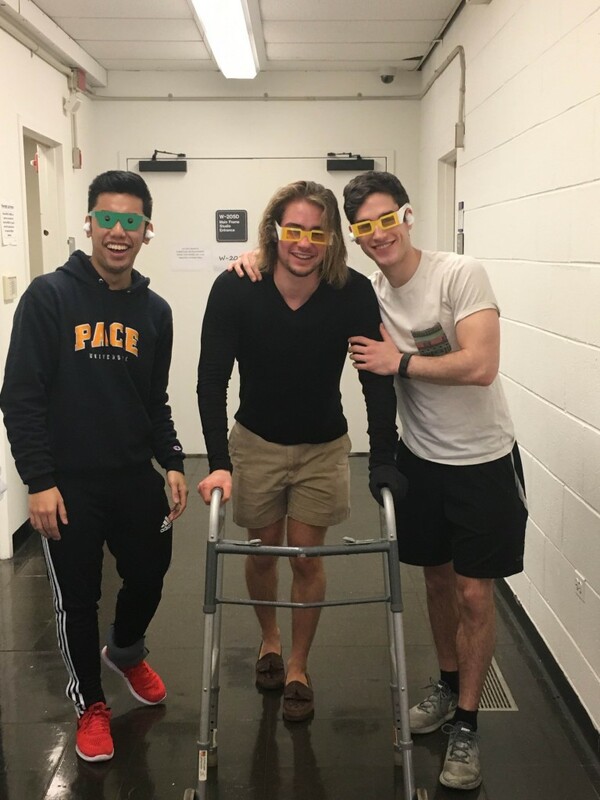 It has been truly special to experience the sharing of warmth and memories over the past few weeks. Jean was an integral part of our community – and will remain so for many years to come. Her influence on students, colleagues, and the work she was most passionate about continues to blossom, and it is evident that she had a meaningful impact on many people. To commemorate and celebrate the life of one of our most esteemed faculty members, we will be holding memorial events on both our New York and Pleasantville campuses. 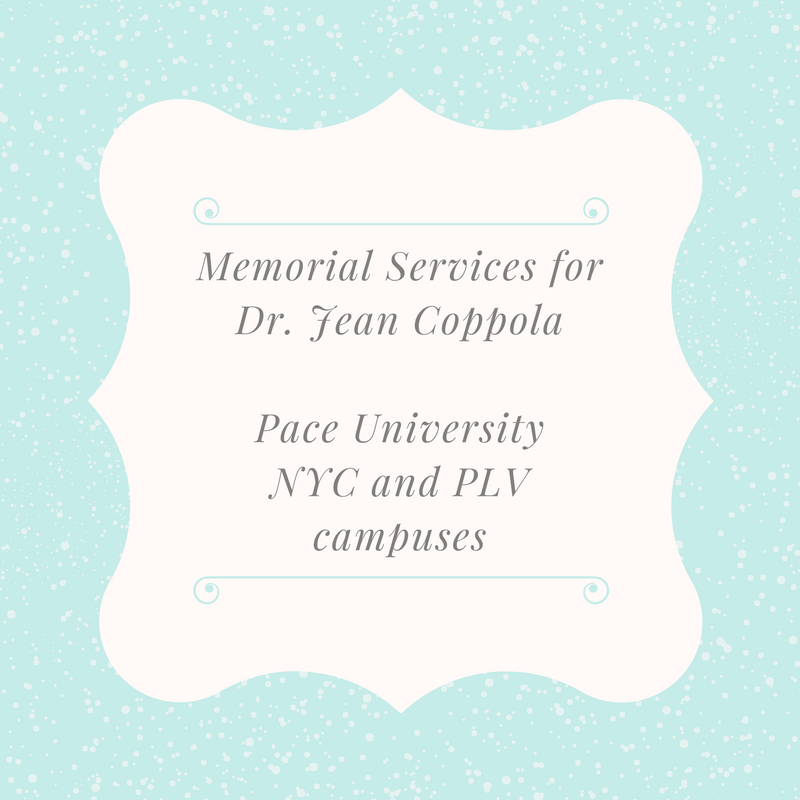 We welcome students, faculty, staff, alumni, and all of our friends in the Pace community who wish to attend and celebrate the many extraordinary achievements of Jean Coppola. Please see below for further information and forward it widely to those who will want to participate. 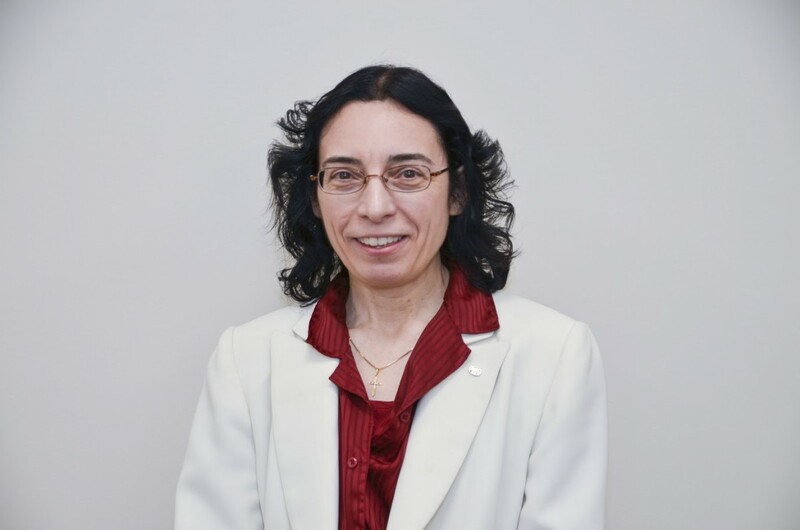 We are deeply saddened to share that our much loved Pace community member, professor of information technology, and friend, Jean Coppola, passed away on Sunday October 29th, 2017. 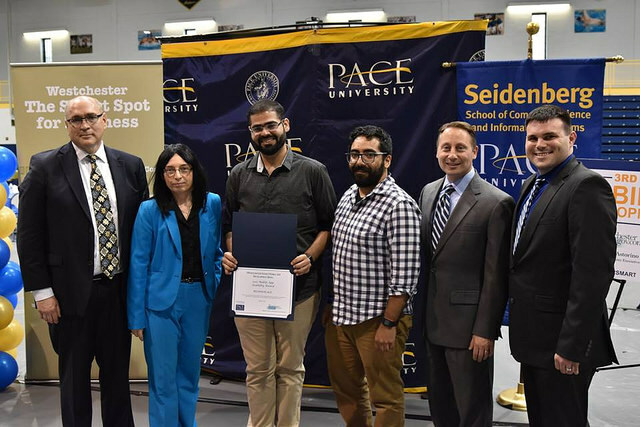 As an integral part of our community, Jean leaves an incredible legacy behind: the creation and management of the WestchesterSMART Mobile App Development Bowl, which ran for three consecutive years with increasing attendance and success; her outstanding work in her life’s passion of gerontechnology, as a founding member of the Pace University Gerontechnology Program, through the mobile app contest, and through the classes she taught; the passion she instilled in her students; her incredible baking skills; her prowess on the softball field; her choir leadership; as a board member for her alma mater St Francis Prep, and so much more. 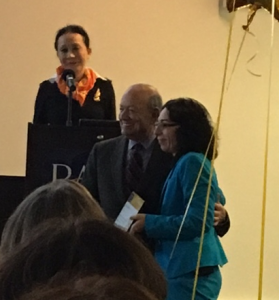 One year ago, Jean was recognized by the Westchester County Association for the second time as she received a Women in Tech Award. A month after that, she was honored at Pace for an astounding 30 years of service to the University, our students, and our greater community. Jean in her element wearing her famous red suit. She has been known around Pace for being one of the sharpest dressed faculty members on campus. As recognizable for her suits as for her intelligence and creativity, Jean always made an impression whether in front of a class of students or interviewing for any one of the international publications that featured her. 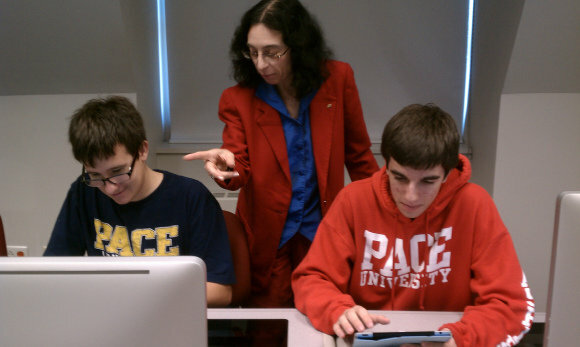 And, thanks to Jean’s passion and determination to share her love of technology in the classroom, her teaching, leadership, and memory will live on in the thousands of students and colleagues she met over the years. 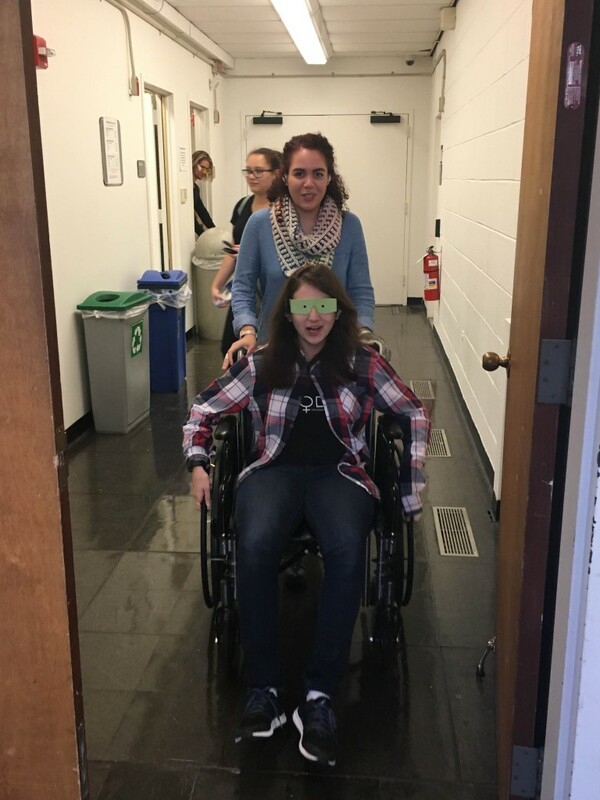 Students experienced the challenges that older people might experience in their everyday lives. This gave them the ability to create apps with the perspective of the user in mind. Even if it was completely different from their own. 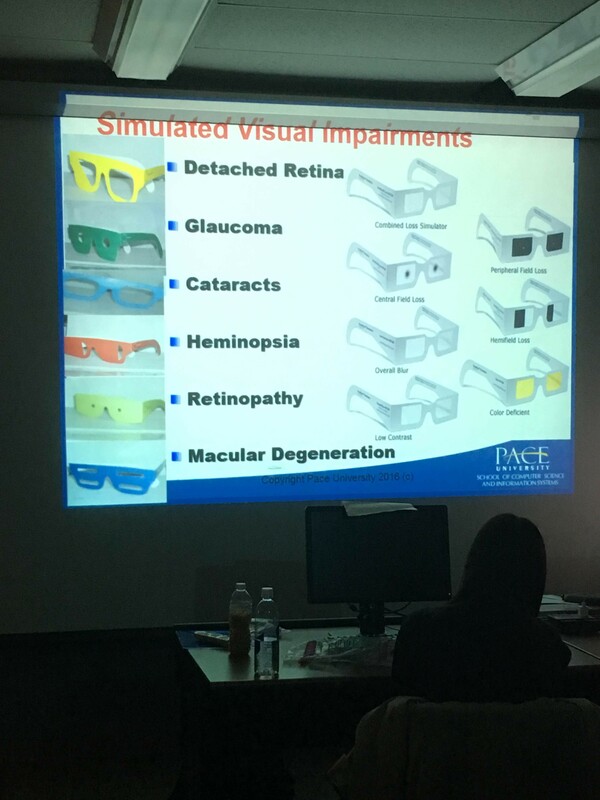 Students learned about living with visual impairment and its challenges when combined with technology. Jean Coppola taught these and many more memorable lessons. 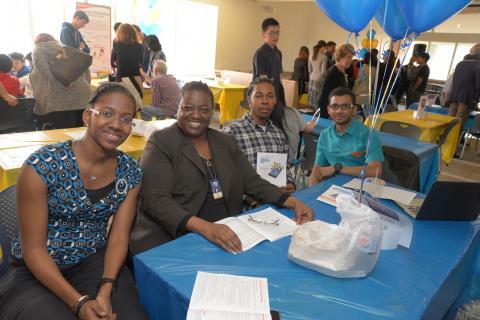 Jean, you will be greatly missed by all of us at Seidenberg. 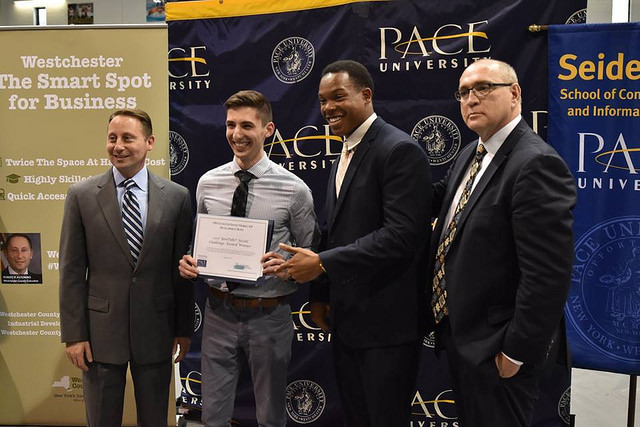 On Thursday, November 17, 2016, several of our hard-working and dedicated faculty and staff members received Pace University Employee Recognition Awards. 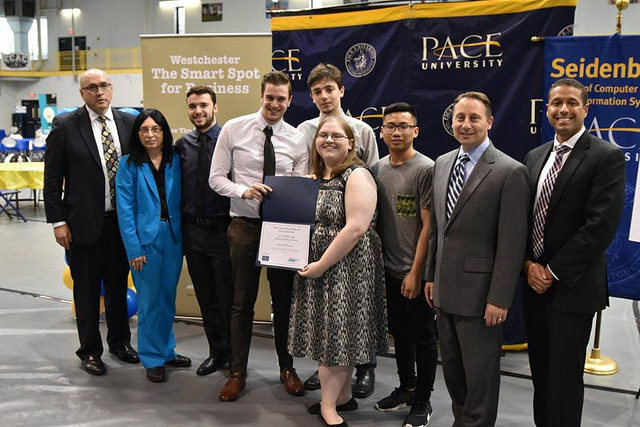 Pace President Stephen J. Friedman was on site at Pace University’s Pleasantville campus to congratulate the recipients, who were being recognized by the University for their years of service. 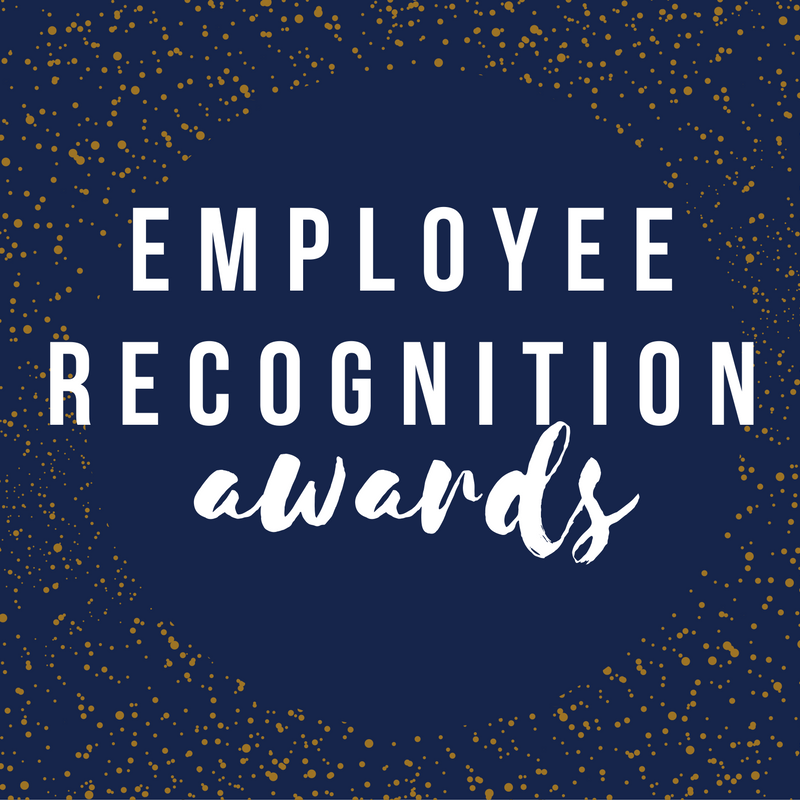 Pace employees typically start to garner recognition for service after 5 years, but these awardees are just a tad past that point! Lisa Slingerland, the Online Student Services Coordinator for NACTEL, was recognized for 15 years of service. 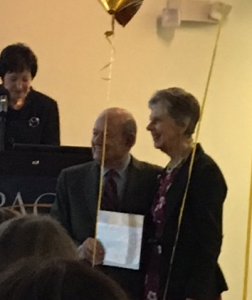 Associate Dean Susan Feather-Gannon and Administrative Director Fran O’Gara received awards for 20 years of service. 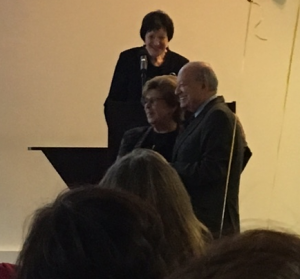 Faculty members Jean Coppola and Ron Frank were recognized for an amazing 30 years of service! 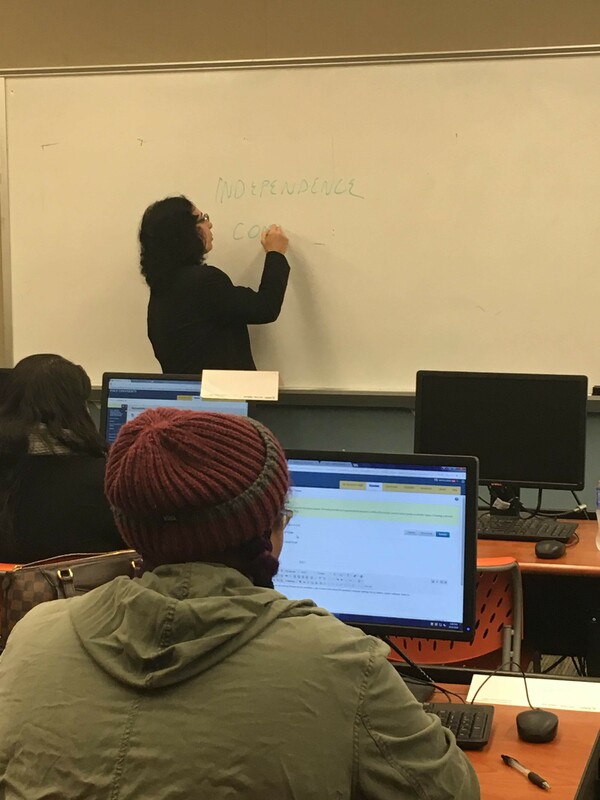 We are proud of the amazing people that work so hard to make Seidenberg great. Thank you to our awardees for your excellent contributions to our school and our students! 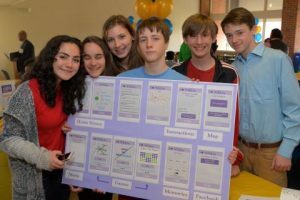 On October 20th, the Westchester County Association (WCA) will be recognizing five women for their extraordinary efforts in STEM fields as part of their third annual “Women in Tech” awards. One of these women happens to be our very own, Professor Jean Coppola! The WCA started this event in 2014 in order to recognize women for their remarkable contributions and achievements while working in science, technology, math and engineering (STEM). 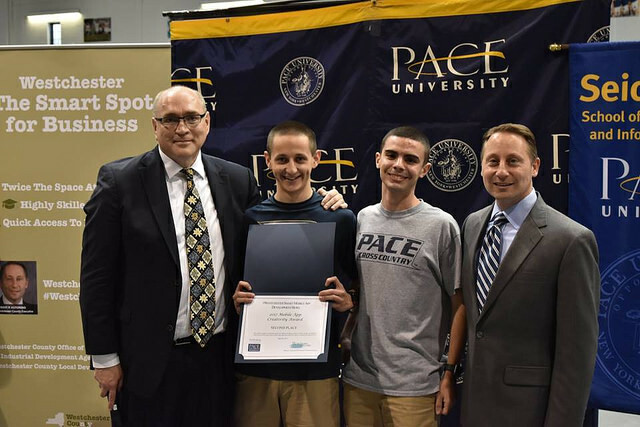 Professor Coppola will be recognized as an award-winning educator, author and professor of gerontechnology at Pace University. 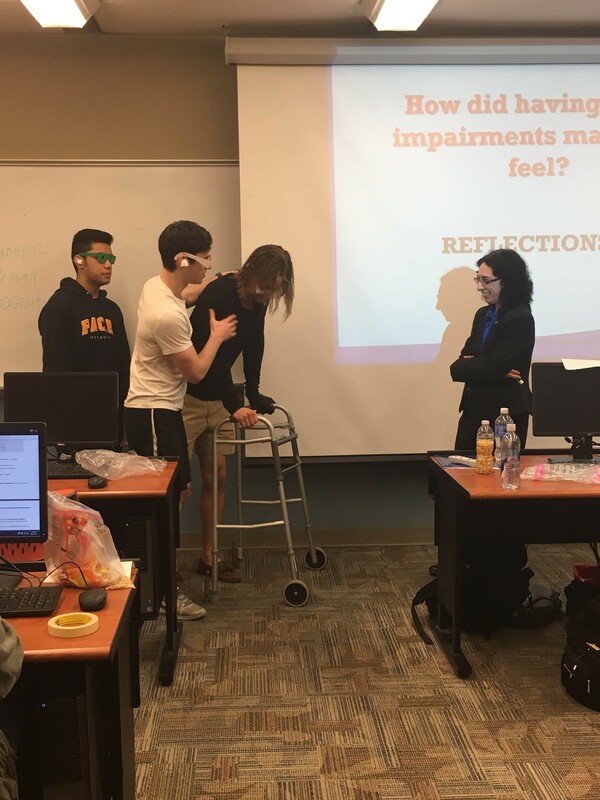 Coppola has won numerous national awards for her extensive research and work with the effects of technology on the quality of life for older adults, including attitudes towards aging and cognitive functioning. We can’t wait for Professor Coppola to receive this award on October 20th. Want to see it happen? You can attend!